There’s a saying in the CAD Hardware world: Powerful, Mobile, and Affordable… Pick two. We here at SolidBox have made a living trying to give you all three, but at a certain point, power and mobility in a CAD workstation come at a premium that a lot of SOLIDWORKS users just can’t afford. For this reason, Epigrid and SolidBox have spent the past three years developing a product that leverages cloud computing to deliver a typical workstation experience that doesn’t skimp on power, mobility, OR affordability: the SolidBox V.
SolidBox V is the bleeding edge of cloud computing, specifically designed for the SOLIDWORKS workflow. Just log into your SolidBox V workstation terminal through our secure VPN client from any device with an internet connection and you’ll be designing in seconds. We tailor the virtual workstation experience to your specific CAD needs. We do this by installing any or all versions of SOLIDWORKS (based on your SOLIDWORKS entitlement), and every other program you use daily. This allows you to have a true SolidBox experience without having to purchase any extra hardware. Design with SOLIDWORKS on your tablet! Do you want to use SOLIDWORKS on your tablet or under-powered consumer-grade laptop? Now you can. Just about any device with an internet connection will meet the hardware requirements for the SolidBox V. Once logged into the SolidBox V, you are leveraging our behind-the-scenes server architecture. This server architecture ensures that you have enough power to process your SOLIDWORKS projects and designs. Our pricing schedule allows you to scale your SolidBox V workstation based on your specific modeling needs. So, changing from 8GB of RAM to 16GB requires no physical effort on your part. Furthermore, we can allocate system resources as needed and resource alterations will not interrupt the workstation experience. Like all SolidBox products, your SolidBox V is optimized for SOLIDWORKS performance in every way possible. 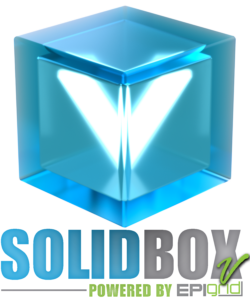 With SolidBox V, you don’t have to worry about the SOLIDWORKS Hardware Requirements or Mastercam Hardware Requirements. We apply our standard series of tweaks and tunes to make this virtual workstation a true SolidBox experience. Once you log in, you will be looking at the same Windows 10 Desktop that you’re familiar with, and any local hard drives from the login device are automatically mapped to the SolidBox V directly inside Windows Explorer. This means that you can access any file, SOLIDWORKS or otherwise, on your local login device from within the SolidBox V terminal without having to transfer them over the cloud or by external Hard Drive. Are you also a SOLIDWORKS PDM user? No problem. Epigrid has been the industry leader in hosted and configured PMD vaults. In fact, they practically created the market for such a service. We can install and configure your PDM vault into your SolidBox V terminal. Therefore, no matter where you are in the world, if you have an internet connection, you have SOLIDWORKS and your PDM vault at your fingertips on any device. For the time being, the physical workstation is an integral part of any SOLIDWORKS workflow. However, as the design and manufacturing world evolves, SOLIDWORKS users are finding work can be done from anywhere at anytime if you have the right gear. With the SolidBox V, the right gear is any device, and the right time and place to get to work is up to you.